I spent a lot of money buying California rolls at Whole Foods and the sushi counter of my supermarket before I found out how easy they are to make. 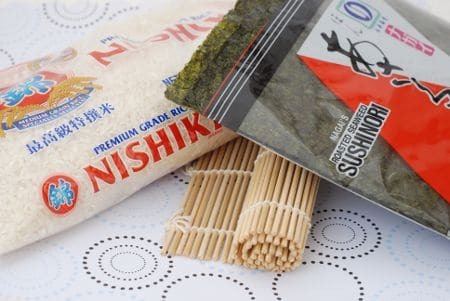 Here are the supplies you’ll need: sushi rice, nori sheets, and a bamboo rolling mat (between $1-2). You’ll find all of these in the ethnic foods aisle of the supermarket. 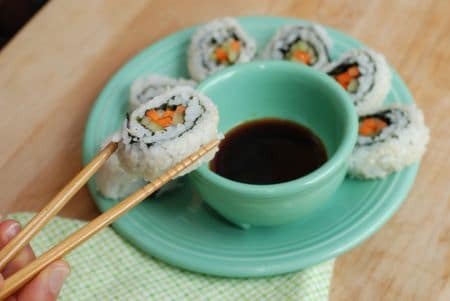 Sushi grade rice is important to create the “stickiness” needed for these rolls. First, prepare the rice: Follow the directions on the back of the rice package (1 1/2 cups of uncooked rice will yield plenty of rice to make 4-6 rolls). While the rice is cooking, combine 6 tablespoons rice vinegar, 2 tablespoons sugar, and 2 teaspoons salt in a small saucepan over medium heat. Stir mixture just until the sugar dissolves (do not boil). 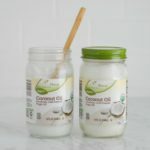 Remove from heat and let it cool until ready for use. When the rice is cooked, pour rice vinegar mixture over rice and fluff using a fork. 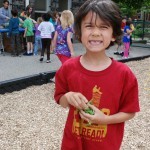 Rice is the stickiest (and easiest to roll) when it is completely cool. A quick way to do this is to spread it out onto a baking sheet. 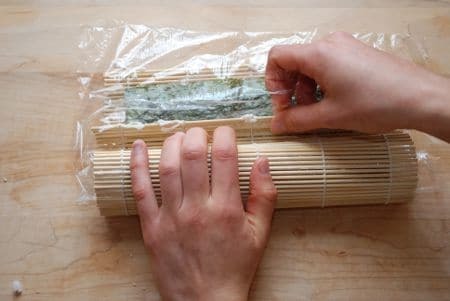 You can also refrigerate the rice overnight if you want to make sushi rolls the next day. Prepare the filling. Slice veggies into thin matchsticks. I used cucumbers and carrots in mine, but consider filling yours with avocado, imitation crab meat, etc. Lay the bamboo mat on a flat surface. Cover with a sheet of plastic wrap allowing a 1-inch overlap from the mat. 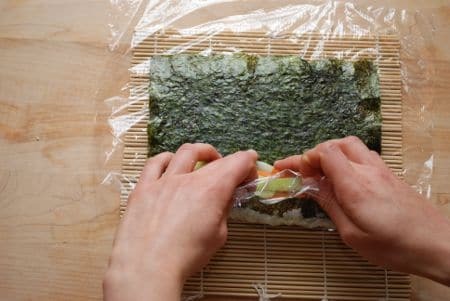 Place a nori sheet over plastic wrap with rough side of nori facing up. 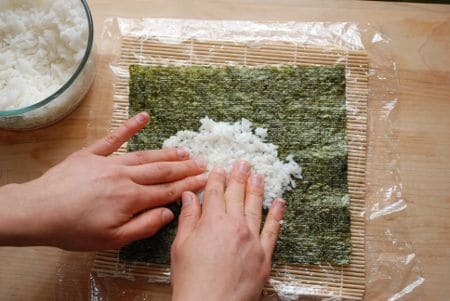 With wet hands, grab a handful of rice and place in the center of the nori. 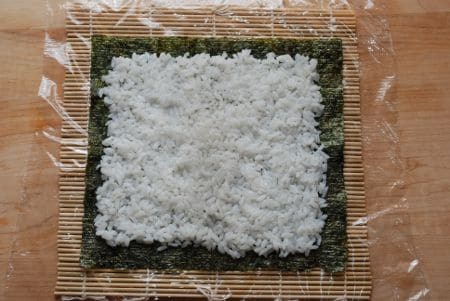 Press the rice out towards to edges of the nori sheet, grabbing more rice (and water) as you go. The rice filling should be 1 cm thick and 1/2-inch from the border. Sprinkle a bed of sesame seeds over the rice. 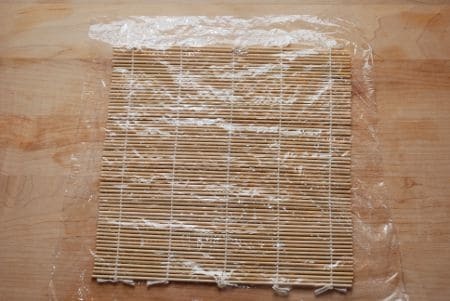 Add one more sheet of plastic wrap over the rice coated with sesame seeds, overlapping 1″ on all sides. 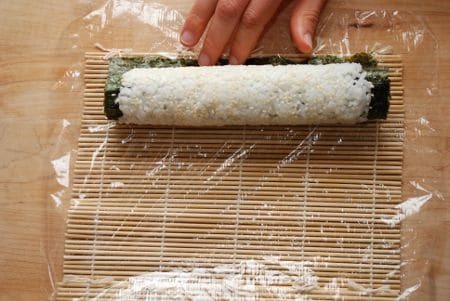 Carefully place one hand on top and flip the sheet so the plain side of the nori is facing up. Then remove the top layer of plastic wrap. 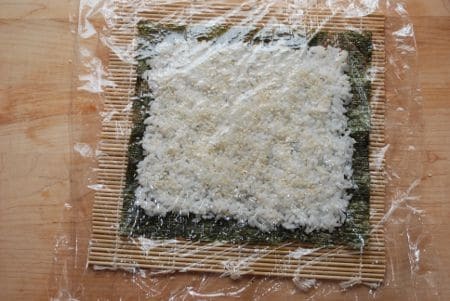 Add your desired amount of ingredients to the center of the nori. 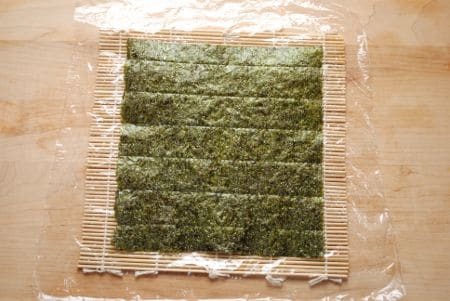 Fold the nori over ingredients and tuck the edge underneath. Continue to roll using firm pressure and peeling back plastic wrap and mat as you go. Dab cold water on the edge of nori to seal the roll. 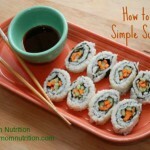 Slice roll in half and then cut into 6-8 pieces. Make the rice by following the directions on the back of the rice package. While the rice is cooking, combine rice vinegar, sugar, and 2 teaspoons salt in a small saucepan over medium heat. Stir mixture just until the sugar dissolves; do not boil. Remove from heat and let cool until ready for use. 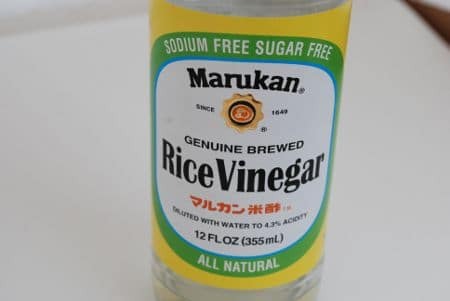 When the rice is cooked, pour rice vinegar mixture over rice and fluff using a fork. Allow rice to cool completely by transferring to a baking sheet. 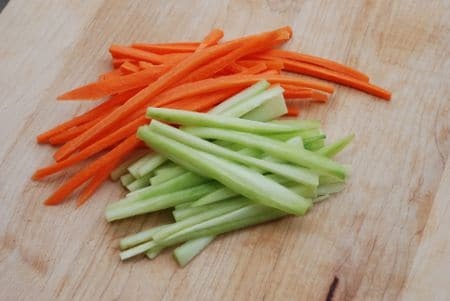 Slice veggies into thin matchsticks. Lay the bamboo mat on a flat surface. Cover with a sheet of plastic wrap allowing a 1-inch overlap from the mat. 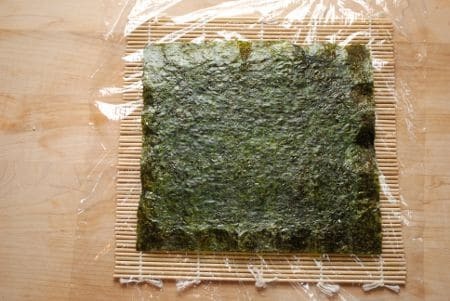 Place a nori sheet over plastic wrap with rough side of nori facing up. 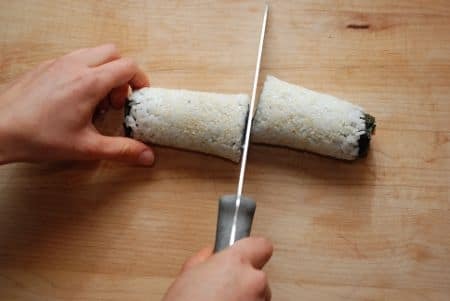 With wet hands, grab a handful of rice and place in the center of the nori. 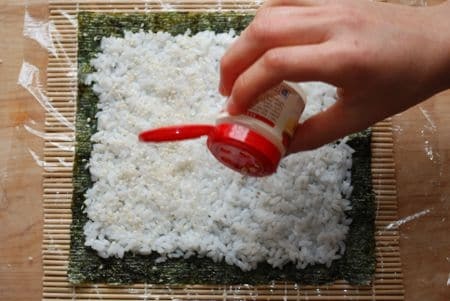 Press the rice out towards to edges of the nori sheet, grabbing more rice (and water) as you go. The rice filling should be 1 cm thick and 1/2-inch from the border. Add one more sheet of plastic wrap over the rice coated with sesame seeds, overlapping 1" on all sides. Carefully place one hand on top and flip the sheet so the plain side of the nori is facing up. Then remove the top layer of plastic wrap. 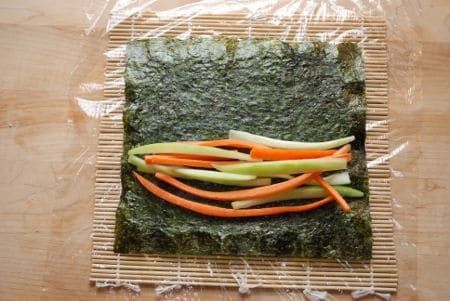 Fold the nori over the ingredients and tuck the edge underneath. Continue to roll using firm pressure and peeling back plastic wrap and mat as you go. Dab cold water on the edge of nori to seal roll. 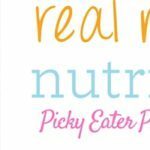 Repeat with remaining nori until you run out of ingredients! 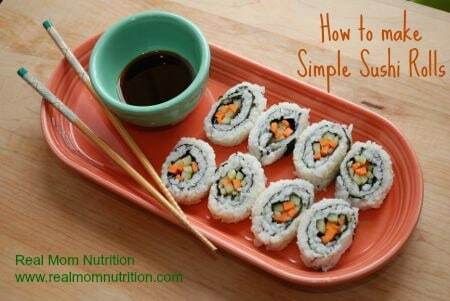 Slice roll in half and then cut into 6-8 pieces. Serve with soy sauce. 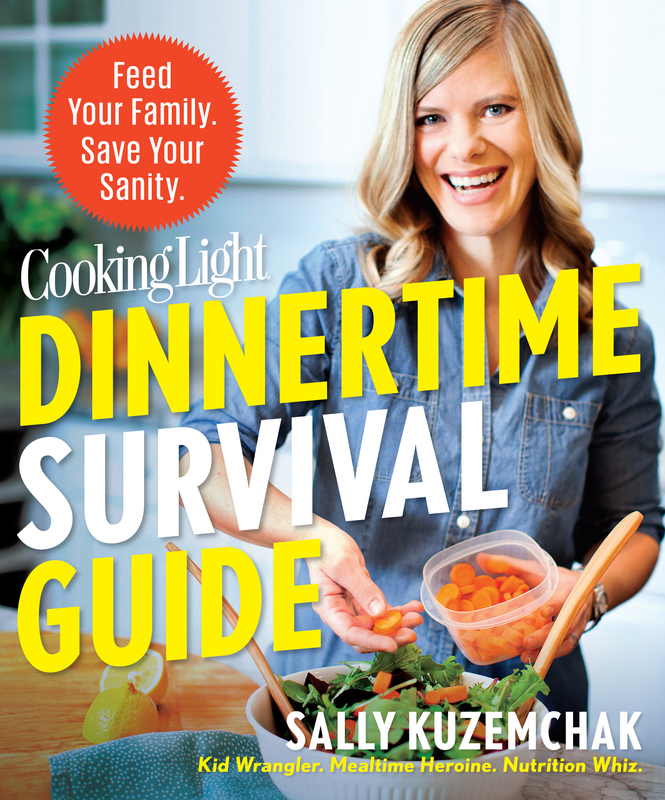 Win My New Cookbook: Dinnertime Survival Guide! Thanks Sally for a fabulous tutorial! I wish I’d seen this before I made my sushi rice. I like how your recipe for sushi rice is for the amount of sushi rice you make when following the package. The other recipes I found out on the web were for way more rice. And thanks for the tip about adding water on the edge of the roll to seal……noted and will try that tonight. Thanks!